Background: Sinusitis is one of the most prevalent infectious diseases among those who visit doctor, which requires antibiotic intervention. The most common types of bacteria causing this disease are Streptococcus pneumonia, Streptococcus pyogenes, Staphylococcus aureus and Pseudomonas aeroginosa. Nonetheless due to dangerous side effects of chemical drugs on body and increased drug resistance of bacteria, new alternative therapeutic method, such as nano-encapsulating herbal essences is considered to augment effectiveness of treatment as well as bacterial sensitivity. Objectives: In this study, the antimicrobial effects of four encapsulated essential oils including Lavandula angustifolia Mill, Cinnamomum verum J. S. Persl, Artemisia sieberi Besser and Myrtus communis L. were evaluated on microorganisms of S. pneumonia , S. pyogenes, S. aureus and P. aeroginosa, which are among the most common factors for sinusitis. Materials and Methods: First, the Minimum Inhibitory Concentration and Minimum Bactericidal Concentration quantitative tests followed by qualitative test (disk diffusion) were performed to examine drug sensitivity. Results: The quantitative result in examined encapsulated essential oils was 0.097 µg/mL for S. pneumonia with Lavander nano-essence, 0.097 µg/mL, for S. pyogenes with Artemisia and Lavander nano-essences, 1.562 µg/mL for S. aureus with Artemisia nano-essence and 3.215 µg/mL for P. aeroginosa with Artemisia and Lavander nano-essences. Moreover, the results of the disk diffusion test showed that nano-essences did not have the ability to be released from paper disks and diffuse in solid environment. Conclusions: The results show proper effects of encapsulated essential oils on the four leading causes of sinusitis microorganisms (P ≥ 0.01) and also the findings indicate that the essential oils can be used to make more effective drugs with herbal resources and fewer side effects for destroying these microorganisms. Sinusitis is an inflammatory condition of the mucosa of the paranasal sinuses that initiated by various factors, such as microbial infections. The rate of sinusitis accounts for 75% in the ambulatory patients who need antibiotic treatment (1, 2). Streptococcus pneumonia, Streptococcus pyogenes, Staphylococcus aureus, Pseudomonas aeroginosa are common causative agents of sinusitis (2, 3). In aromatherapy references, Artemisia sieberi Besser, Cinnamomum verum J. Presl Lavandula angustifolia Mill, and Myrtus communis L are introduced as antimicrobial agents (4). Thujone, camphor and verbenol are the main components of Artemisia sieberi Besser essence (5-7). The major ingredients of Cinnamomum verum J. Presl are cinnamic aldehyde and linalool (8, 9), Lavandula angustifolia Mill essence is mainly composed of linalool (8, 10) and Myrtus communis L essence contains alpha-pinene and 1,8-cineol (11-13). The metabolism of essences is faster compared to chemical drugs and these herbal essences generally have fewer side effects. Volatility characteristics, low solubility in water and oxidation capability necessitate the attempt to find the new techniques for increasing the antimicrobial activity of essences. The most important ways are formulations and modifications that can be applied on essence oils to improve their quality, efficacy, and biological activity. Thus, it is considered to employ new drug and herbal component formulations based on nanoscience to enhance the efficiency of active herbal ingredients especially essences, which are proven to be antimicrobial agents (14-16). Nanogels or nanocapsules are the most important nanoformulations. Polymeric nanocapsules are produced in various sizes and shapes in the simultaneous polymerization process (14, 15). Chitosan is a nontoxic, natural and biopolysaccharide which derived from chitin and can be used as an antimicrobial agent. Chitosan has a powerful antimicrobial effect on a wide range of microorganisms such as fungi, Gram-positive and Gram-negative bacteria (17). The antimicrobial activities of nanocapsulated essences of Cinnamon, Artemisia, Myrtle and Lavender are not well-studied till now. This study aimed to evaluate the antimicrobial effect of nanoencapsulated essences of Cinnamon, Artemisia, Myrtle and Lavender on common bacteria involved in infectious sinusitis. In this experimental study, common bacterial strains were cultured primarily on blood agar and Muller Hinton agar and the cultured media were incubated at 37°C. In the next stage, Minimum Inhibitory Concentration (MIC), Minimum Bactericidal Concentration (MBC) and disk diffusion assays were conducted using various concentrations of prepared nanoencapsulated essences based on the Muller Hinton agar. Brain Heart, Muller Hinton agar and blood agar used in the study were purchased from the Merck chemical company. The following microbial strains were used in this study: S. pneumonia PTCC (1240) NCTC (7465), S. pyogenes PTCC (1447) CIP (5405), S. aureus PTCC (1112) ATCC (6538) and P. aeruginosa PTCC (1430) ATCC (27853). All strains were obtained from Iranian Center of Industrial and Medical Fungi and Bacteria Collection. All essences including Cinnamon, Artemisia, myrtle and lavender were purchased from Barij Essence Co. Kashan, Iran. To produce nanoencapsulated essential oils, 0.5 g chitosan was dissolved in 100 mL of 1% acetic acid (pH = 3-3.5) employing a magnetic stirrer. The solution was sonicated for 20 minutes to complete the homogenization of chitosan. Then, Carbodiimide-activated myristic acid was added to the chitosan solution drop by drop while vigorously stirred and the pH of the reaction mixture was set as 4.5 - 6.5 using 0.1 M sodium hydroxide. The resulting concentrated viscous gel was centrifuged three times by adding absolute ethanol to remove any excess and unwanted materials. Finally, to generate the 5000 ppm nano-essence, approximately 25 µL essential oils was mixed with 5000 µL previously prepared chitosan-myristic acid nanogel and was sonicated in a ultra-sonicate device for 5 minutes. The surface and shape of nanocapsule walls were observed using a Scanning Electron Microscope (SEM) and Transmission Electron Microscope (TEM), respectively. To prepare the samples, 5 µL of the generated formulation was diluted 2 folds with distilled water and ultrasonicated for 15 minutes at the power of 40 weeks. Dynamic Light Scattering (DLS) caused by Brownian movement of particles was used for estimating the size of particles in liquid. Diffusion of small isometric particles in liquids had enough speed in causing faster fluctuations within the intensity of scattered light in comparison with large particles, which diffused more slowly. These intensity fluctuations were recorded in the DLS experiment. Autocorrelation analysis of the measured diffusion coefficients, under assumption of a spherical shape of the particles, yielded a mean particle diameter expressed as z-average. In this study, the DLS was performed on Malvern Zetasizer Nano at 25°C in a cuvette (glass quadrilateral with rounded aperture fixed at an angle of 90 degrees). Each measurement was repeated at least three times and the obtained results showed a good reproducibility (18). To prepare the microbial suspension, 4 - 5 colonies were transferred from 24 hours culture to the sterile physiologic serum using a sterile straight wire near the Bunsen burner flame; and then placed in a 37°C incubator. Turbidity of suspensions was compared with standard McFarland turbidity, after 2 - 5 minutes and adjusted by physiologic serum or fresh colony (19). After inoculation of microbial suspension of S. aureus, P. aeroginosa (adjusted to 0.5 McFarland standard) on to the Muller Hinton agar medium with swab, 9 millimeter discs dripped with 10 µL nano-essence were placed on the agar surface in a regular order. Plates were then incubated at 37°C for 48 hours. The blood agar was utilized for S. pneumonia and S. pyogenes. Common appropriate antibiotic discs were used as positive controls. For determining the MIC, initially 100 µL of the BHI broth was added to each well of the standard 96-well microplate. A serial dilution for Cinnamon, Artemisia, and Lavender nano-essences was prepared in a 96-well plate (100 µL each well), and then 100 µL of each solution transferred from first well to the second to reach 1:2 dilution and this was repeated across all wells finally 100 µL was discarded from the last well. The fist and the last wells had the highest and lowest concentrations, respectively. Afterwards, 100 µL of the standardized microbial suspension was added to each well, and two separate wells used as positive (microbial suspension without nano-essence) and negative control (highest concentration of nano-essence without microbial suspension). Microplates were incubated at 37°C for 48 hours (19, 20). This test was carried out for each bacterium and nano-essence, twice in aseptic conditions. Microplates were observed visually and read at 540 nm on an Enzyme-Linked Immunosorbent Assay (ELISA) reader. The lowest concentration with inhibited growth was considered the MIC for that organism. To obtain the MBC, three different concentrations with MICs and the bacterial concentration before and after MIC were all cultured on blood agar and Muller Hinton Agar (50 µL from each well pipetted to the culture medium). After 48 hours incubation at 37°C, the cultured media were assayed for colony formation and growth; and the concentration in which 99.9% of bacteria were dead, considered as the MBC (19, 20). The DLS was performed on Malvern Zetasizer Nano at 25°C in a cuvette (glass quadrilateral with rounded aperture is fixed at an angle of 90 degrees). 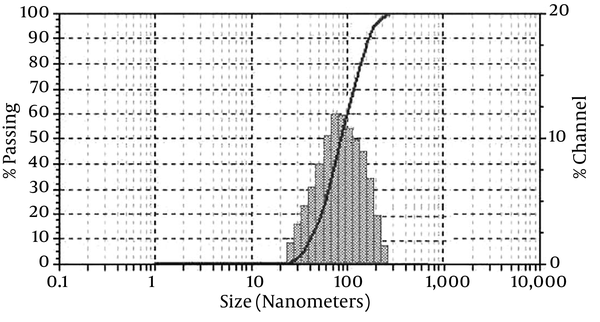 Figure 1 shows the distribution of various sizes for nanoencapsulated essences. Based on the nanogel polymerization conditions, nanocapsules obtained with average particles’ diameter and particle size distribution were calculated in the range of 88.5 - 189 nm and 35 - 400 nm, respectively. 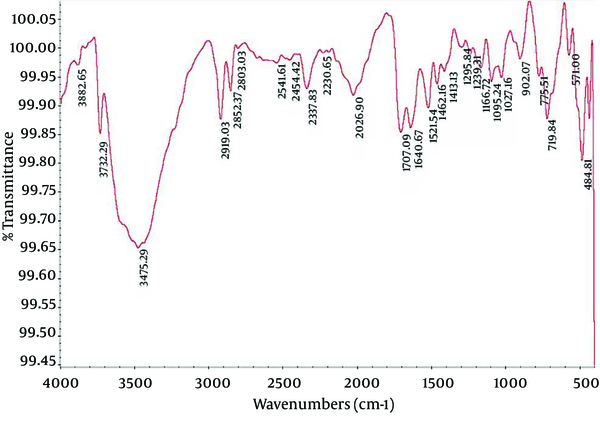 Fourier Transform Infrared (FTIR) spectroscopy is a powerful tool for biological studies. The Infrared Radiation (IR) is passed through a sample. 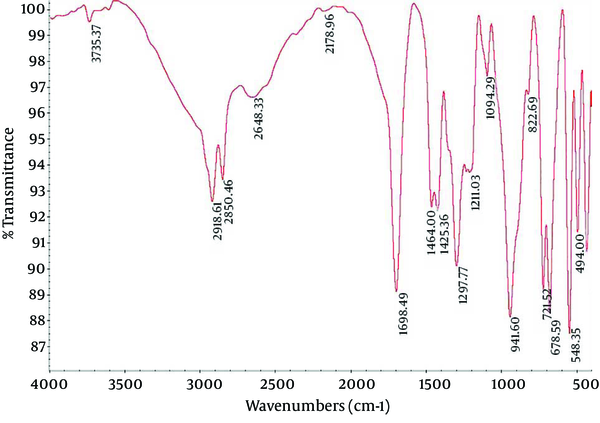 Some of the infrared radiation is absorbed by the sample but some of it may be passed through (transmitted).The resulting spectrum represents the molecular absorption and transmission, creating a molecular fingerprint for the sample. Like a fingerprint no two unique molecular structures produce the same IR spectrum. This makes infrared spectroscopy useful for several types of analysis. 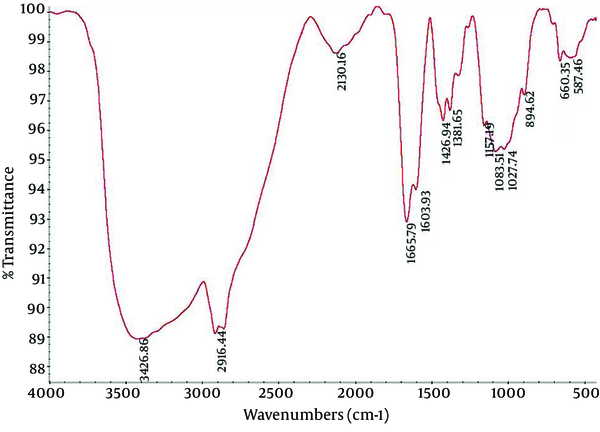 Figures 2-4 depict the FTIR image of nanogel major components. The resulted peaks on the FTIR spectrum were used to derive a dose-response curve and provide pharmacological and toxicological information quickly and simply. Evaluation of essence MICs for S. pneumonia indicated that the best MIC occurred for nanoencapsulated essence of Lavender with concentration of 0.097 ug/mL, Lavender and Artemisia for S. pyogenes (0.097 ug/mL), Artemisia for S. aureus (1.562 ug/mL) and Lavender and Artemisia for P. aeruginosa (3.125 ug/mL). Also, the MICs and MBCs determinations were performed twice and produced the same results (Tables 1 and 2). No inhibition zone was observed using the disc diffusion method. After repeating and evaluating the results, it seemed that essences could not be released from the nanocapsules' paper discs on solid agarose. Therefore, the positive results of MICs and MBCs determination can be referred to the high accuracy and also advantages for the microdilution broth method versus disc diffusion method. Bacteria colonized in the upper respiratory tract can proliferate and cause infection in immunodeficient conditions or if the nasal and facial sinuses do not drain efficiently in situations such as illness, stimulators, drugs or trauma. Inappropriate treatment can lead to complications with a serious threat for individual health (1, 21). At the present time, antibiotic treatment of these infections faces various problems that limit the antibiotic therapy. Thus, herbal resources attract more attention due to lower side effects and in some cases better and faster effects. Studies in Iran and other countries suggested the antimicrobial activities of herbal essences (4, 11). Due to volatility characteristics, low solubility in water and oxidation capability of essences, it is required to discover new techniques for increasing their antimicrobial activity before utilizing them for treatment. One of the most important methods is harnessing nanoscience for formulation and manipulation of essences to increase the quality, and effect and to prolong biological activities (14, 16). Very limited studies have been carried out about properties of nanoencapsulated essences till now. Sefidkan and the colleagues concluded that the Nasturtium officinalis nanoencapsulated extract could eliminate more cancer cells with the same concentration and period in comparison to noncapsulated one (22). Our results and those by Negahban et al. suggest more and prolonged effect are attributed by Artemisia nanoencapsulated essence due to its controlled release (15). Mashhady Rafie and the colleagues used Artemisia sieberi nano-essence to treat dermatophytosis induced by microsporum canis in guinea pig model, and their results showed that this nano-essence was an effective drug to treat M. canis infection (23). The results of the present study suggest that nano-essences, similar to pure essences, have significant effects on Gram-negative as well as Gram-positive bacteria. Comparison of the results of this study with Mahboubi and colleagues demonstrated the strong antimicrobial effect of Artemisia essence on Gram-positive, Gram-negative, and fungi (6). The comparison of the results illustrates strong antimicrobial effects especially for Cinnamon and Lavender essences on pathogens of respiratory organs, Inouye et al. also stated this impact (24). In the present study the MICs in micro plates were visually evaluated and read by a standard ELISA reader and no significant difference was observed between the two methods (P ≤ 0.05). Also, evaluation of 42 hours and 72 hours incubation showed similar results (P ≤ 0.05) suggesting that the active constituents of essences can be released at the initiating hours and increasing the incubation time could not have a significant effect on their antimicrobial activity. A comparison of both the MICs and MBCs in our results with other studies demonstrates a similarity in minimum of concentrations as inhibitory or bactericidal. We wish to gratefully acknowledge the Iran University of Medical Sciences, and we also would like to thank pharmaceutical sciences branch of Islamic Azad University for providing research support. Authors' Contributions: Study concept and design: Susan Ghorbani Darabad; analysis and interpretation of data: Mansour Bayat, Afshin Mohsenifar, and Susan Ghorbani Darabad; drafting of the manuscript: Seyed Amir Yazdanparast, Susan Ghorbani Darabad and Setareh Haghighat; critical revision of the manuscript for important intellectual content: Seyed Akbar Moosavi, and Susan Ghorbani Darabad.